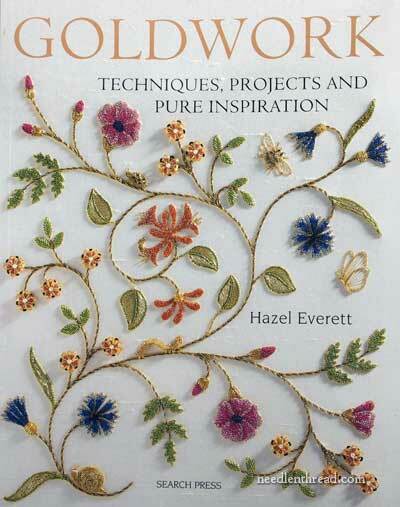 Goldwork Techniques, Projects and Pure Inspirations by Hazel Everett – there’s a lot I could say about this book. If you are remotely interested in needlework, if you are toying with the idea of trying goldwork, if you’re a pro at goldwork, if you only like looking at goldwork and never intend to do any…. You Need This Book. It is a WOW book. First, there’s that whole question of eye appeal. 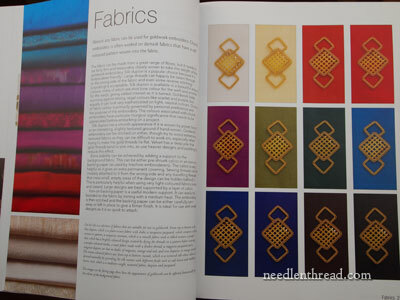 Color is everywhere in this book – the richest of colors, combined with the richest of gold threads, in the creation of sumptuous projects that are fresh, beautiful, appealing. It’s a joy just to look at this book. But there’s more to it than just eye-candy. The book is thoroughly instructive. The author takes the reader through each step of goldwork – from the essential beginning information on project set-up, to the tools, to the fabric, to the threads, through all the techniques for each kind of goldwork thread …. it’s all in here. 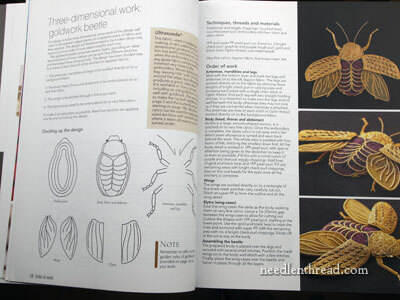 The various ways of approaching goldwork are covered in the book: are you working a dimensional goldwork project? She covers it. Padded goldwork? Flat goldwork? Only chipping? Only couching? Everything combined? It’s all in here. 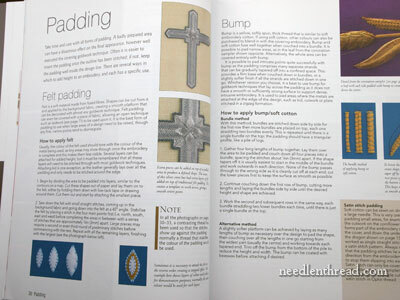 I think Hazel Everett has one of the most thorough sections on padding and types of padding for goldwork that I’ve seen in any goldwork book. And it’s all very easy to understand, laid out with good photos and handy little side notes and tips. 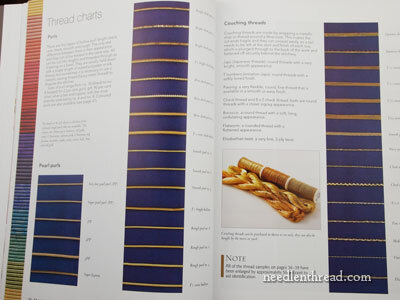 If you’re not familiar with all the types of real metal threads available on the market today, you’ll find the pictorial thread charts in the book very handy. They’re arranged according to type of metal thread, with images of each thread in their various sizes. The techniques section of the book is where the meat of the whole matter of goldwork can be found. 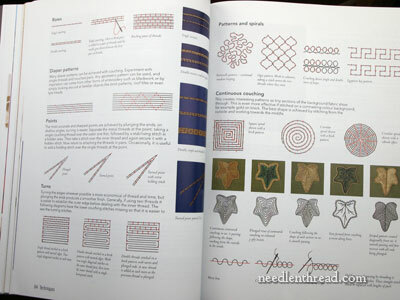 The author presents the various techniques of working with real metal threads through “samplers” that show how the threads look when treated a certain way. Under techniques, Everett treats each type of thread in general, and then shows specific applications. She also looks at specific goldwork techniques up close, like Or Nué and appliqué. With photos and diagrams, she makes goldwork accessible to the beginner while feeding plenty of fresh ideas to the amateur and beyond. 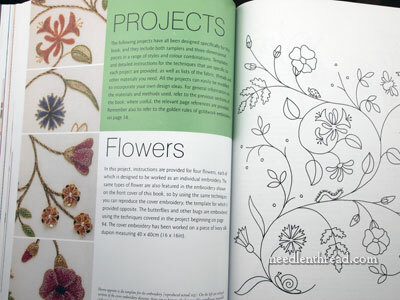 Towards the end of the book is the projects section. From flowers to bugs to book covers to samplers to hanging ornaments – there are plenty of projects in here to inspire you. I’m afraid I didn’t show you the Best of the Book here. There are some knock-down gorgeous projects within these pages! Worth taking the time to sit with a nice cup of tea and browse your eyes out. Gosh, I love it when a book is everything I hoped it would be! 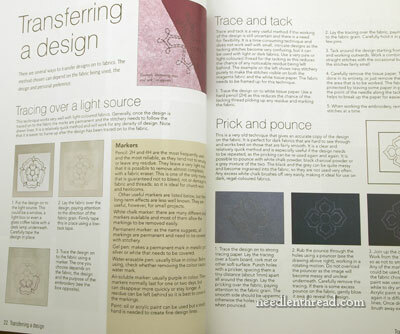 Goldwork Techniques, Projects and Pure Inspiration by Hazel Everett is published by Search Press. If you can’t find it in your own country, consider ordering it through The Book Depository (free world-wide shipping), where it is competitively priced. In the US, you can find Goldwork Techniques, Projects and Pure Inspiration through Amazon. It’s proving to be a popular book, so if you want it, now’s the time to get it! March 6, 2013 Revisiting the Marian Medallion Project – in Book Form! It is THE best goldwork book I’ve ever bought – and I have quite a few! Thanks for the reminder, Mary! I’ve been tending to wait until you review a new book before buying lately. I just ordered a copy from the Book Depository – they have it in stock and free worldwide shipping. Can’t wait to get my hands on it. *sigh* I plan to sell some books or something to get this one!!!!! This is an amazing book and a definite must-have. Buy it, you’ll love it. It’s simply wonderful. I really fell for the cover and added it to my wishlist, now I see that the inside is just as good as the cover promised. That cosmic whimper you just heard was probably my wish list groaning at another addition! And based on the comments, it will be moved up the list by quite a few entries. Thank you for the wonderful review. Now I will purchase it. The cover was tempting but your review cinched it. I love the sampler idea to show how the different threads look and work. I should know better than to ever read one of your book reviews because I know that my wish list will grow. This one is no exception! I don’t do goldwork but I certainly love looking at it and methinks this is definitely droolworthy. Beautiful and inspiring book! I think it’s a must-have. Mary, from what I can see the blue flowers on the top right side, and on the bottom left side seem to be made of the material that the ballet tutus are made. I know….not quite!!! it is all done with thread. Thankyou Mary for your wonderful review. I have the book ordered, and can’t wait to get it. I still have yet to try my hand at gold work and I guess I am still a bit green with embroidery but to have something like this that will help me “jump” into gold work will be wonderful. A special thanks for yet another book that I just have to have. I really now need you to offer magical expanding bookshelf suggestions :). So………..evil question. If you had to choose between A-Z Goldwork and this one, which one would you choose??? Brilliant answer! Since I have A-Z, I think my budget *will* extend to Everett 🙂 I want to read that discussion on different types of padding you mentioned. (That’s what has stuck in my mind as well). How would rate this book for someone interested exclusively in historical goldwork – in other words does she use historical techniques? I wrote up a mini-review of this book over on the historical group on FB this morning. It’s a wonderful book, full of really great information and inspiration. It’s not a historical book though, from my point of view. 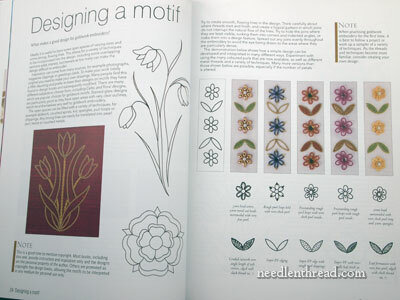 If you are looking for something along the lines of what we’re getting in the Thistle Threads goldwork class, it’s not in this book. I haven’t found any of the elaborate stitches so far and I’ve been over it cover to cover. It’s more modern, but there is information I have not seen anywhere else. It’s definitely worth buying, IMO. Hi, Mary – Well, it’s not historical, in the sense that the projects are for modern goldwork. But the basic techniques of goldwork are the same, nonetheless. Purls are sewn on the same way whether they are sewn on today, or were sewn on hundreds of years ago; passing threads are couched the way they’re couched; Or Nue is Or Nue; a spangle is a spangle. The basic techniques don’t change all that much. It’s just how they’re interpreted that makes the difference. The distinct difference, if you’re comparing to Tricia’s work on Thistle Threads, is that goldwork threads are normally not “stitched” with today, as much as they are sewn onto the surface of the ground. But 17th century gold threads (the supple ones) were used for stitching (plaited braid, chain, etc.). So the threads passed through the fabric (or through other stitches), whereas in most real metal thread embroidery today (not considering historical re-creations), the threads are sewn on the top. Also, threads made from a combination of silk and metal (like Gilt Sylke Twist) or unusual silk threads (like silk purl) were used for filling and stumpwork techniques in the 17th century, but aren’t used so much in “real metal thread embroidery” as it is done today. So, in that respect, yes, it’s true – Hazel Everett’s book is not a “stitch dictionary” of 17th century stitches that can be done with metal threads (and that can also be done with other threads, too). 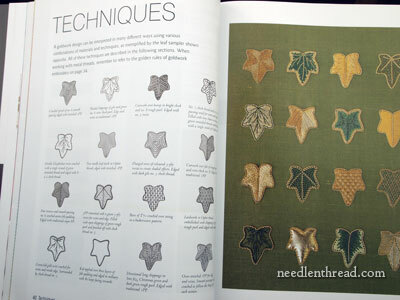 Aside from that specific area of stitchery, though, the techniques for using real metal threads are the same, and Hazel Everett’s book demonstrates these techniques well. So if you’re looking for a 17th century stitch dictionary, this isn’t it. But if you’re looking for something fresh and new with the age-old techniques used in real metal thread embroidery, then this book will fill the bill. You are so right – EVERYONE needs this book. Even my non-needlework friends love it. And I have just had the particular joy of attending one of Hazel’s classes and seeing her work in the flesh. I was so excited! Hazel is so good at sharing her inspiration. She is so approachable and makes goldwork accessible. She is immensely talented of course, but wears her fame lightly and encourages everyone to create. Which is what the book does so well. Hazel’s work shows that goldwork has a future, and it can be fresh and colourful. Brilliant. Especially now that my copy is signed! My husband and I were driving along when I pronounced ‘. I am in love ‘ oh came the rather tentertive reply anyone I know? Previous Previous post: Historical Embroidery Fans – Look What’s Coming!